by Dave from The Longest Way Home ~ May 30th, 2011. Updated on October 5th, 2013. Published in: Travel blog » Malaysia. I’m not a huge fan of museums. Though I love history, and have a keen interest in world war one & two, these often bland, sterile buildings bore me. An exception, and it’s not really a museum, was my visit to Auswitch & Birkenau, which was harrowing. Both share a trait of large areas outside rather than cramming everything into dusty old buildings, or recreated areas. They are historic sites where things actually happened, rather than buildings built to hold objects: I think this creates lot more emotional impact. I read about the open-air element of Penang’s war museum and was intrigued. It turned out, for me, to be a heart wrenching place of significant value. More over, I was utterly disappointed in many people’s feelings about the place. Entrance fee: 30 ringget for foreigners. 10 ringgit for Malaysians and 5 ringgit for children. Built in the 1930’s by the British to protect Penang and defend the Malacca Straits from southern naval approaches to this region. It’s an impressive engineering feat; for that time. Led by the British Royal Engineers and overseas convicts from India, laborers dynamited and excavated into the 20-acre rocky hill to build the initial fort. Under which was a labyrinth of reinforced military tunnels. Included in this were a munitions depot, intelligence /logistic centers, offices, an infirmary as well as sleeping quarters. Already an impressive sight underground. Above ground is strewn with ventilation shafts leading into the hill, artillery firing bays, and yet more munition bunkers. Manned by British, Malay and Sikh soldiers; attack by sea was near impossible. And yet, Penang still fell in a tale of historic military maneuvering. 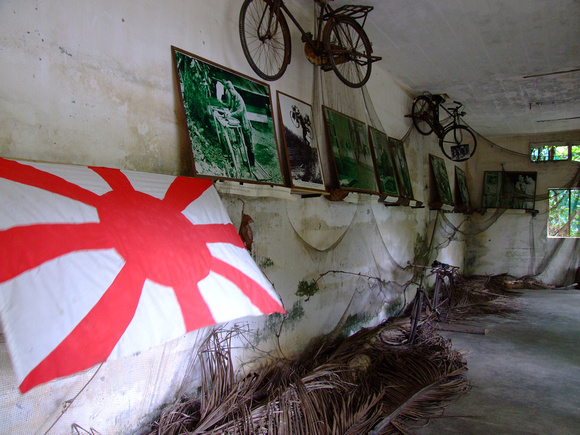 Following the British surrender of the island in 1941 to the Japanese, the site became a prison camp for Allied soldiers and a scene of terror for all. 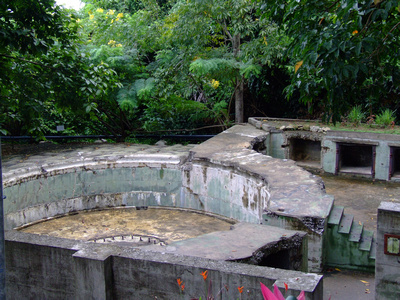 In a little known fact, the sea surrounding the fort became a German U-Boat harbor under the command of Kptlt. Fritz Schneewind. He then led the first U-boat campaign into the Indian Ocean which also helped the Germans penetrate into the Pacific alongside the Japanese. Looking at the 30 ringgit price for foreigners vs 10 for locals I already felt cheated. I’d arrived by bus, and walked a distance to the now privately owned war museum building up a heavy sweat along the way. Surrounding me were several locals arriving in nice comfortable private cars. I won’t turn this into tourist vs local price debate. But, this just feels wrong, for this type of facility at least. Pushing back my initial feelings and marching ahead to avoid the local families I diverted from the giant guiding arrows on the ground. And, went straight to the underground bunkers. Wider than expected the arched tunnels were well-lit. A musty smell in the air was mixed hints of old leather and dust. The reason became apparent as the tunnel unfolded into a large war office at the end. Decorated with old photographs, dusty munitions, uniforms, desks and maps of the region it was reminiscent of a scene from a world war two movie. Still, it lacked a little something called personality. There was not much to tell me who was stationed here in terms of physical photographs, nor personal details. However, the brief history that was there, was enjoyable and I found several more rooms like this underground. Perhaps the most impressive sight of all in these rooms were the huge low ceilings. Plated with armor to protect everyone from bombardment via the sea or air. Linking many of these main tunnels are several much smaller, unlit, escape tunnels. For use if the fort fell to enemy occupation, or a collapse of one of the main rooms under strain from offensive artillery above ground. Very glad to have a torch on my phone, I needed it to see through the unlit low and very narrow concrete tunnels. Dank with the smell of bat guano my shoulders scraped along. Then, halfway through I turned the torch off. Pitch black. It’s a strange claustrophobic sensation that sets in a mild panic. Deeper breaths are needed for crouch walking into the unknown. The air now seems thicker, heavier and staler. I left the tunnels just in time. Some local families were just arriving, wild and crazy children included. 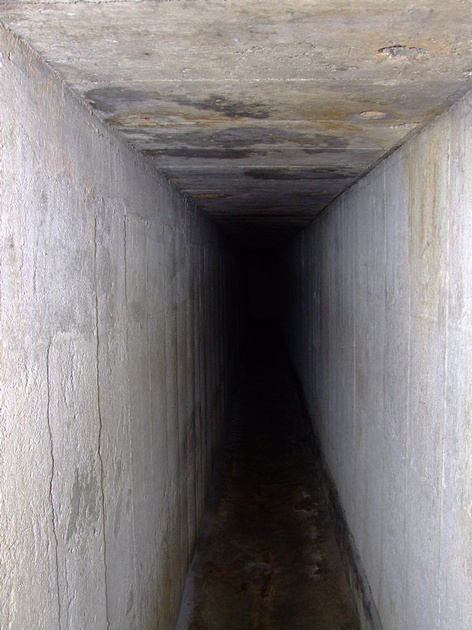 Echo’s of bizarre shouts down tunnels left behind I climbed up onto the heavy artillery stations above. Concrete bunkers littered the area. Some looking more like bare concrete houses, others had rusty old military railings allowing you to climb up and around. Most of the canon bays are no more than circular concrete areas. The main base area of the heavy shelling guns was there. A recreated full length barrel would have made it all the more impressive. Instead it was a case of recreating the events of yesteryear and looking around the old munitions area. 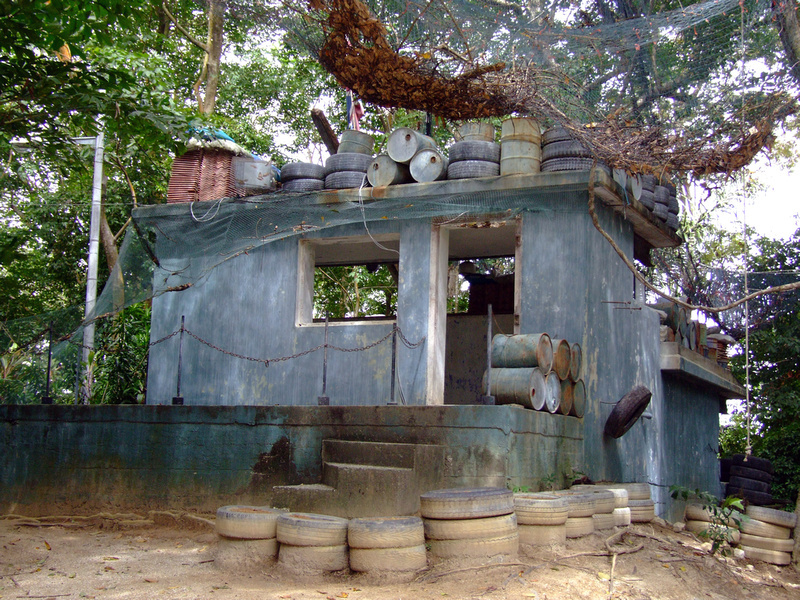 Up further and I stumbled across the strange paint-ball area in Penangs open air museum. Considering I have not written about the real terror that occurred here after the British left, this, to me, had the air of tastelessness about it. It jarred slightly, fake killing in a place once used for real killing. I digress. Moving on past this area I was prepared now to leave the open air museum. Only I caught a glimpse of a small sign pointing down the forested hill to the “prison cells“. 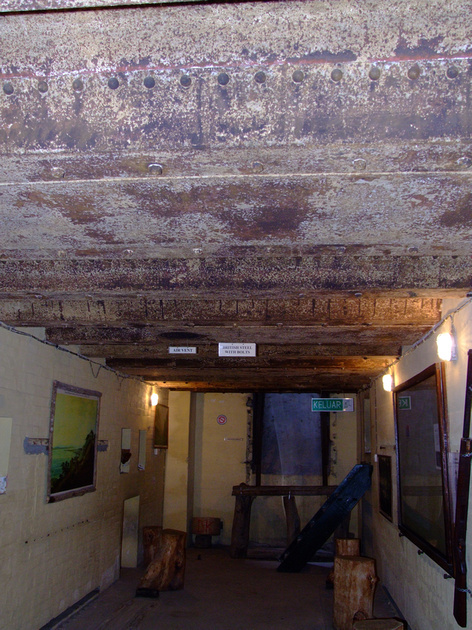 I was fairly taken back with what I saw in the prison chambers in Penang’s open air museum. I’ve seen worse, but not displayed like this. 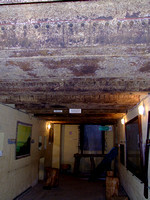 Unfortunately, they are badly maintained, unkempt and deteriorating. I think the owner of the open air war museum in Penang (Johari Shafie, Malaysian) has done reasonably well here. He did after all discover the place, and along with his wife restored it with their own money. This is great. And, an interesting story in itself. But, the signage is lacking, badly kept, as is much of the historical data on display. These are simple, inexpensive things that which if improved can make the experience a lot better. The owner seems for have spent a lot of money researching other facilities like this around the world as examples. Yet, has fallen short of actually preserving and displaying this history in his own backyard. Moreover, can you lose the two tier pricing system? It jars terribly in such a place, with such a history. I know they need to make money to keep the open air museum running, but charge everyone equally. I recommend you try my own hotel search for Penang, Malaysia. The best online rates guaranteed! Thanks for sharing about the museum. NOT to get to political, but that war was for freedom from Fascism and Tyranny. Being close to Burma and Thailand, where the government has MUCH to say in the lives of people in those countries, it is amazing to me that people still believe that more government is better – even with the WW ll relics that you share about so close by. I believe that we are at that point in today’s world where we have a similar structure that we had when WWll started – a system that was encroaching on peoples rights – the system was – you got it – anti-us! I find in Central America that the people strongly believe they are used by the powers that be. The government is for a selective group. Even after all the revolutions and conflicts, it is still dictatorial. Did not mean to get way off track – but WW ll was the last war that America set out to win. From that point on, police actions have really accomplished nothing. Unfortunately, history repeats itself. I hope, in my lifetime, that we do no set up structures for war and detention camps like they had back then to leave for another “museum”. Cheers, be safe, enjoy the journey and have fun! Some very good points John. And I believe what you are saying about a system that’s encroaching on people’s rights. It’s happening all around us, it just baffles me why very few people see it, nor care. P.S. You might enjoy next Sun/Mon’s post, as I touch on many aspects you raised here. I never knew there was such history in Penang. I also think its a shame when there are different prices depending on where you are from?! What year is this place living in. How can we develop when this sort of thing is still happening? It’s not just here Anna, there are two tier prices in many parts of the world today. India, Nepal, and the list goes on. I don’t think it’s correct. Interesting historical piece here. Shame it’s not been kept up that well. I also don’t like the idea of two tier prices. But that’s what you get when dealing with countries like Malaysia. I do not think they are developed enough to equal the west. Though from what you are saying, it seems they think they are! There are some really developed parts of Malaysia. Yet the irony is, with a lot of development, it’s not like a “western” development. Which is fine, but it leaves many people wondering about things like human rights, animal rights and even things like maintenance. Some of the places interest in Penang are used with 2 standard prices. The Penang Hill (Newly launched the new Funicular Train), Toys museum & Butterfly Farm. Shame on them indeed. Dave, Have you experience to War Museum in evening? Their operating hours starts at 7pm until 12 am. I went there few times, but NEVER in the evening..
Hi Lya, I’m not visited the war museum at night. I imagine it’s closed in the evenings. I was there pretty much until late afternoon and people looked to be closing up then. HELLO? ANYONE THERE? You are starting to sound like a 6 year old. It is what it is and it “ain’t going to change” Period, End of story. Grow up. Well Bob, if you could say what specifically you are referring to in your remarks it might help? War, prices, the state of the place, the list goes on? Either way, if no one calls for change, we might as well shut down and stop believing in anything. I, for one, won’t do that. 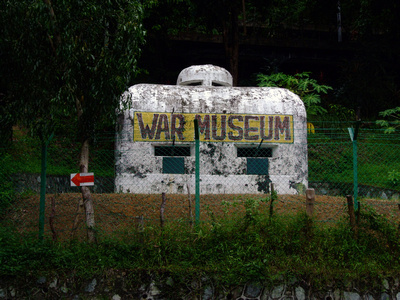 I’ve heard a lot about this war museum during my 4-year stay in Penang, and surprisingly, mostly from the foreigners! I haven’t been there myself but your story certainly provides a different insight to this place, other than what I used to “there’s nothing much in war museum. It’s boring. It’s not worth the money paid” Oh well, I guess it just needs some digging huh? Very interesting picture and story about the tunnel though, when you said you left the tunnel in time, did you mean you left it at the other end or you had to turn around to exit from where you came in? You might not like next weeks post, also on this subject!! Bit worried about your feelings on that. Can I ask you, why in 4 years of living in Penang did you not visit the museum? Oh I know you meant you escaped the tunnel in time but does it open at the other end? Or it’s a dead ended tunnel? Ah, yes the tunnel goes right through the office area. Kind of like in a big loop! Yer, I met lots of people who said the same about the museum being boring and expensive. Though 10 ringgit isn’t too bad eh? It’s one of the reasons I wanted to write about it here. With a little, and I do mean little, bit of work they could really make the place more sale-able. Better signage and history as an example. 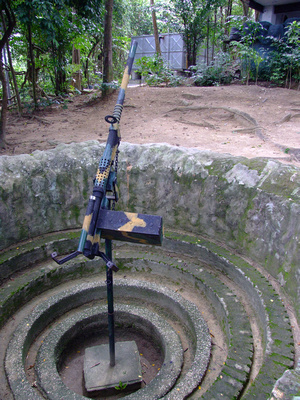 It sounds rather like the Cu Chi tunnels outside of Ho Chi Minh city in Vietnam, where if you liked, you could fire an AK-something rifle at US$1 a bullet. Must admit South East Asian museums (apart from some in Singapore) are terrible, compared to European or Australian museums. The expertise is simply not there, to tell a story well, which of course is a shame, because I’m sure there are some incredible stories to be experienced. But the reality is, even subsidized by government, museums are hideously expensive to run and maintain, never mind the exhibition and interpretation development. Signage is harder and more expensive that you think. Agree that the 2 tier pricing is unfair, but I can understand the reasoning behind it: locals generally earn much less than tourists. Not sure, though, a price 3 times of that of locals can be justified – that’s just greedy. I understand the logic behind a two tier pricing system. But I would make it local, as in only people from that town get a lower rate. Outside of that town, the prices should be equal. It’s 2011, and poverty exists in all parts of the world. As does wealth. On this day, I was the only person taking public transport to the museum. Everyone else had a private car, and yet were only paying 10 ringgit to get in. I have to agree with you on the lack of “story telling” in many Asian Museums. Even in Xi’an, China, at the terracotta army I found little information beyond some dates. I wonder why this trend is mainly found in Asia? Do you think the educational curriculum in Asia is lacking when it comes to history? I would be interested to hear your thoughts on that one! I think it’s hard to pinpoint why there is this consistent thread of really really dull interpretation in Asian museums. But it’s clear that most Asian museums have not kept up with the latest thinking in museum development. Of how to make museums relevant, engaging to today’s audiences. Western museums have made that transition, Asian museums haven’t, Maybe they haven’t, because they haven’t the people with the right skill set or mindset. It could be that the education systems are not producing the right type of people to lead museums and curate artifacts. So cultural preservation is sacrificed or adapted to the whims of the Gods of profit. And no love is given to crafting the story. Having said all that, I love the Sarawak Museum, in Kuching. It’s a time capsule. Walk in, and you’ll be transported into the colonial Victoria era. It’s so old fashioned, it’s fabulous! Some very good points again Liv. I’ve written about some of this in the follow up post next week. I’m also quite sure some of my findings will not sit well many people. But such as it is with personal observations and opinions. Let’s see, as always, I’ll be looking forward to your own opinion on the subject matter. I have no issues with museums and places overseas charging a two tiered entry fee, but 30 vs. 10 is a little excessive. $10.00 usd to enter a war museum in Asia is pricey. Although the fake killing rubs me the wrong way too, they need to do things like that to bring in the family crowd. It is a good way to mix up fun with education. Not many know about World War II in Malaysia. It definitely took a back seat to other theaters, so it is important to bring this to people’s attention. @Ted We’ll have to agree to disagree here Ted. Local, as in town people, I have no problem in them seeing their own history for free, let alone a reduced price. But to charge a foreigner a separate price is in this day and age, I find insulting. Take the amount of foreign development aid going to many countries with two tier price systems. Not to mention the foreign money often times given into restoration of many sites. Then slap a 2 or 3 times above a local price onto a ticket, and it does not sit right with me. SAARC countries get discounts in many places in Asia as well. Yet surely the people who can afford to travel, are also well able to pay equal entrance fees. Would such a system work in the USA or Europe? No, it would be deemed discriminatory. No, if there is going to be a two tier pricing scale, then it should be done on a socio-economic basis. Which administratively today, is not yet possible. Regarding the fake killing. I think they could have done something else there. Or, at the very least not have had half buried skeletons and the like on the actual museum site. Similar types of things happen in Vietnam, and Cambodia. Again, I am sure their are better ways to fund-raise for the museums up keep. You are spot on with the fact that not many people know about the history of World War 2 in Malaysia. I think you’ll find next weeks post interesting in that regard. Though I also think some people will take offense on certain topics I bring up. Either way, I’d be interested in your thoughts! Dave, I enjoyed reading your description of being in the tunnels, as the feeling you described by having to crouch and walk with a heavy breath, was exactly how I experineced the Cu Chi tunnels in Vietnam. I couldn’t agree more with your dismay at the two tier pricing. It really rubs me up the wrong way when I come accross this. Paintaball, like any activity has a time and a place and should definetelty not be held at an historical site such as this. Glad to have you on-board regarding the two tier pricing system. The Taj Mahal kicked off my dislike for it when I visited. In some countries you’d be sued for having one price for some people, and one for other people. In this day and age, if countries want to enter into international “developed” world rhetoric, then they’ll need to play the same game on the same field. Are there no signs here at all? It seems terrible that a museum would have no information. There are indeed signs Stuart. In fact inside the tunnel offices the signs are quite good. And outside things are marked out. But down at the prison cells it’s very poorly laid out. Also, some of the signs are not very tasteful. Putting some personality into the displays would change a lot of things. Sounds like an interesting museum, if a bit rough around the edges. I also get annoyed by dual pricing for foreigners… especially if the locals are pulling up in luxury cars. Look forward to part 2! This was such an interesting blog! Thanks for sharing! Good luck to you! locals don’t really appreciate museums..dats why they cut the price half, as a sort of encouragement..